This was being used in handling sessions and needed a tooth to be reattached (huzzah for Paraloid B72), but I noticed that it lacked an identification beyond ‘monkey’ and I thought that could be improved upon. I know what I’ve narrowed it down to, but I’d love to hear your thoughts in the comments section below! 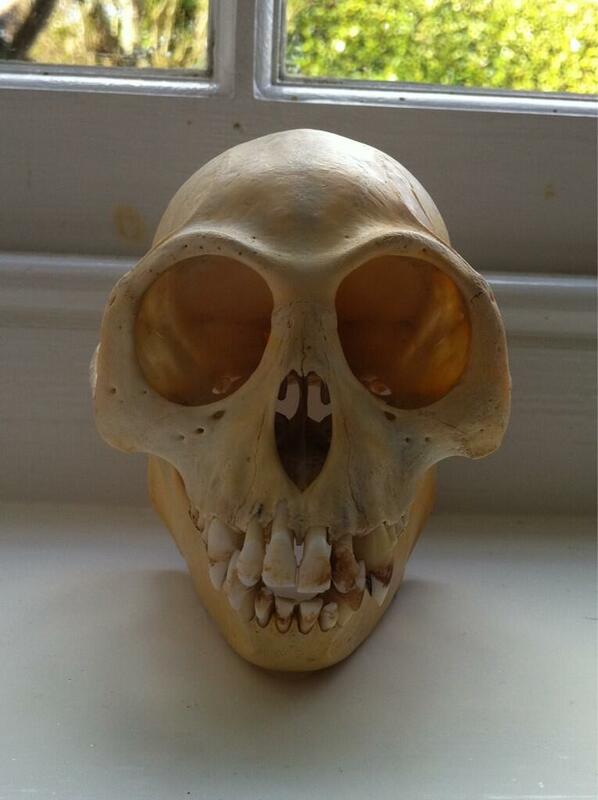 Now this is quite obviously a primate, as it has a bony ring around the orbit, a bony back wall to the orbit and just eight incisors as opposed to the twelve that forms the basal condition for mammals. 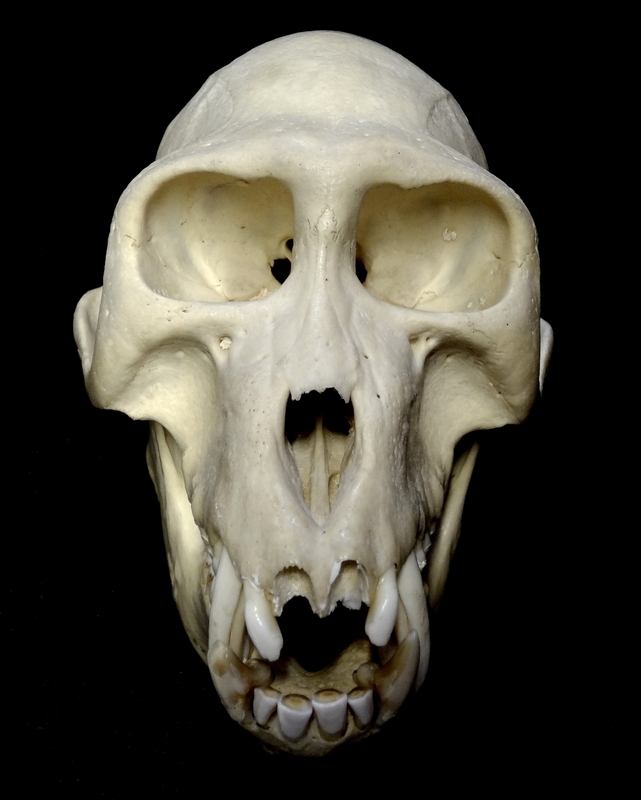 The teeth also tell us that this is an Old World Monkey (Cercopithecidae), since these primates only have eight premolars instead of the twelve you find in the New World Monkeys (Platyrrhini). The small canines suggest that this is the skull of a female. From there it starts getting a bit more difficult. The fairly small size of the specimen ruled out a few genera, but the main features that helped narrow down the possibilities were the very flat face, the heavy bony rings around the orbits, the flaring of the zygomatic arches (cheekbones) and the short and rounded braincase. Effectively the only way to consider these features is to look at a lot of comparative specimens (the excellent Mammalian Crania Photographic Archive proved very useful for this). Everyone spotted that it was from a monkey, perhaps unsurprisingly since monkeys have a very characteristic appearance, with a globular braincase and forward-facing eyes. 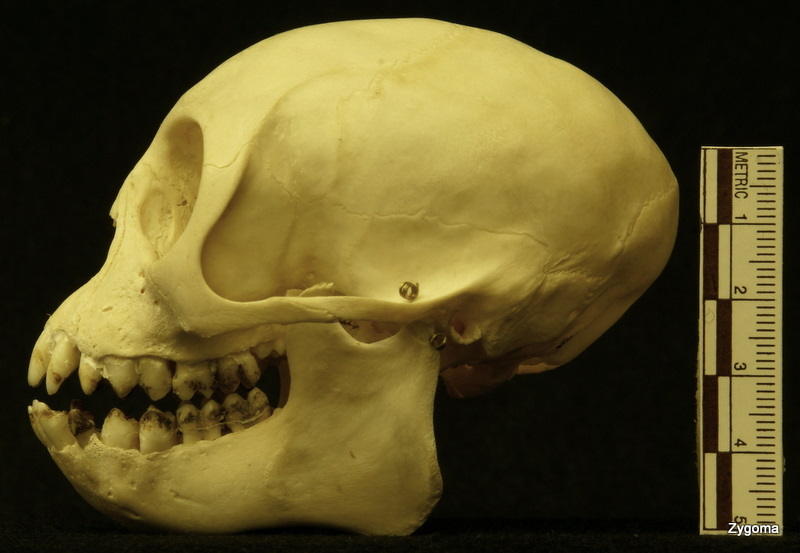 The orbit is enclosed by a solid bony ring and there is a post-orbital wall made up of the sphenoid and ethmoid bones, that produces a cup-shaped eye socket. But there are a lot of different monkey species – around 286 if you include the Apes (as you should). 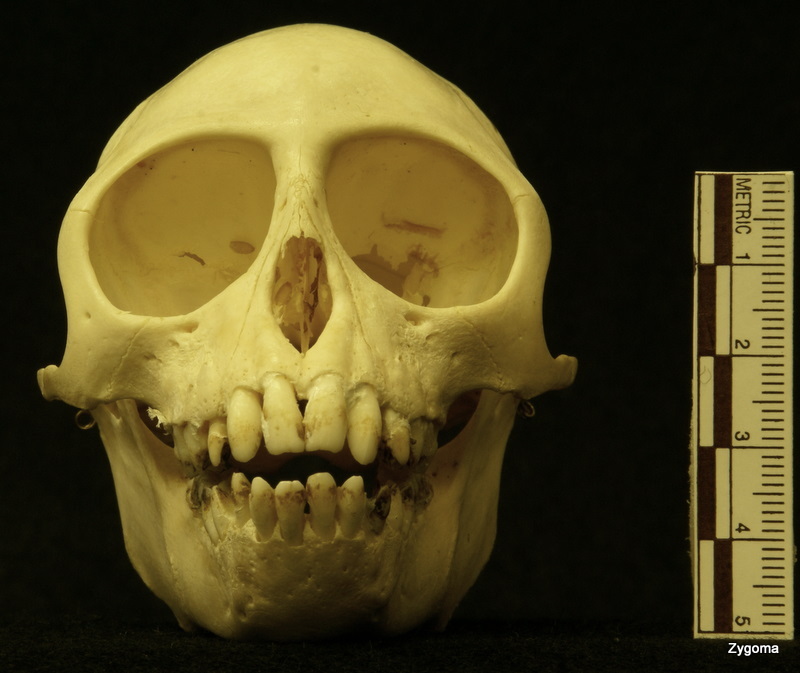 We can see that this specimen belongs to the Catarrhini clade (the Old World Monkeys and Apes) since it only has 2 premolars instead of the 3 premolars you’d expect in a New World Monkey (N.B. some extinct Catarrhines known from fossils have 3 premolars, so this useful distinction doesn’t actually help define the clade). The size of the skull and the the shape of the nose region and the mandible isn’t quite right for an Ape, or a typical Cheek-pouch Monkey (like Macaques or Baboons), leaving us with the Colobinae (which includes Colobus Monkeys, Doucs, Langurs, Leaf Monkeys, Proboscis Monkeys, Snub-nosed Monkeys and Surelis). Once we get this far it becomes rather more tricky to identify what species we’re dealing with (and it doesn’t help that the names are applied somewhat inconsistently), so I must offer congratulations to Jake, jonpaulkaiser, curatorialtrainee, henstridgesj, carlos grau and Steven D. Garber, PhD – all of whom suggested perfectly possible candidates amongst the Langurs and Snub-nosed Monkeys. Yes, apes are monkeys and therefore so are we. I’ve said it before and I’ve given my reasons, other biology types have said it and given their reasons, yet a crime against pedantry rages unabated. There are some important questions in life and this probably isn’t one of them, but it seems to have generated a lot of debate, so it’s clearly a topic that needs resolution. Why wouldn’t apes be monkeys? If apes are indeed monkeys as I suggest, why do so many intelligent and knowledgeable people insist that apes are not monkeys? I think that perhaps it’s because apes didn’t used to be monkeys. Let me explain. Taxonomy is the science of naming things and it was established as a discipline by Carl Linnaeus in the mid 1700’s. Evolutionary theory was not part of science at the time, so there was no real understanding of why species formed recognisable groups with shared common features – but those shared features proved useful for classification. Linnaeus – and the taxonomists that followed in his footsteps – went about classifying things based on the presence or absence of physical and behavioural characteristics. According to the Linnaean system of classification monkeys were medium or small in size and had tails, whereas apes were medium to large in size and didn’t have tails. Simple, apes were not monkeys – except the Barbary Ape Macaca sylvanus (Linnaeus, 1758), which was quite obviously a monkey despite being medium-sized and having no tail… spot the problem? In the 1950’s a taxonomist called Willi Hennig had the bright idea of applying an understanding of evolutionary relationships to taxonomic classifications – he called this phylogenetic systematics. It was an idea that made sense, because rather than basing groups on arbitrary characters that might be open to convergent evolution (like becoming tailless), species could be grouped together (in something called a ‘clade’) according to common ancestry. What a nifty idea! However, this idea has taken time to get established, since identifying clades means compiling and analysing a huge amount of data. It wasn’t until computers became capable of taking on some of the workload that phylogenetic systematics (or cladistics) became properly established – in real terms this meant that progress was slow until the mid-to-late 1990s. Computers running cladistic analyses can tell us if apes are monkeys. Since cladistics has taken off, there has been an effort to marry Linnean classification terms with evolutionary classifications where possible, to limit the confusion caused when discussing groups of organisms. There are rules in the form of PhyloCode, but they don’t really address common names associated with clades. As a result this revolution in taxonomy has been largely ignored by the public and indeed by scientists not involved in the process. Nonetheless, it directly impacts on how biological terms are used. In this instance the issue impacts on whether apes should be considered monkeys – the fact that they share a clade, suggests that they should. But is monkey a valid term? Neither ‘monkey’ nor ‘ape’ are proper scientific terms, but both are commonly used in scientific literature, so they should have formal recognition as valid biological terms. That means that they should be aligned with definable clades, since that’s how taxonomy is done these days. In this case the Simiiformes clade for monkeys and Hominoidea for apes. Common usage of biological terminology may be slow to follow the science, but if it wasn’t related to taxonomy we’d still be calling whales ‘fish’ (which is a fascinating story in its own right). Certainly there would be no justification for denying that apes were monkeys if people were not referring back to traditional taxonomy, because the term would be defined by usage alone and people do call apes monkeys. In fact, it’s only seems to be in English that a distinction is made between apes and monkeys in common terminology and even then the terms have long been used interchangeably. Of course a hard-liner can argue that we should just ditch the terms monkey and ape and stick with proper scientific terminology. I agree with the logic from a scientific perspective, but culturally it would be a bit much to expect the public to toe the scientific hard-line. Should apes be called monkeys? Let’s face it, it doesn’t really matter if apes are called monkeys. Monkey is a more generic term than ape, which means it’s not very accurate or meaningful when talking about apes. Therefore it’s not really very appropriate unless the person using the term has a limited ability to identify very characteristic primates. These are good reasons for not using the term monkey when referring to an ape, but nonetheless an ape is still a monkey. So feel free to criticise the use of monkey when referring to a Chimpanzee (for example), but don’t do it by saying that Chimps aren’t monkeys, because you’d be the one who is wrong – at least from a cladistic perspective. 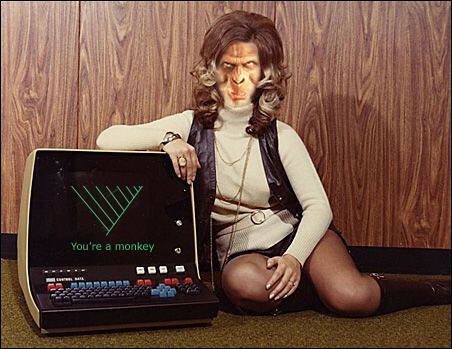 I don’t know about you, but I’m getting tired of monkeying around the topic. So as a pedant with a professional interest in this issue I am taking my stand, to help ensure that a miscarriage of pedantic justice doesn’t occur. Apes are monkeys in the same way that monkeys are primates, humans are apes and I am a human – it’s called a nested hierarchy. This means that all apes are monkeys, but not all monkeys are apes. Just as all humans are apes, but not all apes are human. By the same token, humans are all ape, contrary to the title of the otherwise rather good book 99% Ape: How Evolution Adds Up. 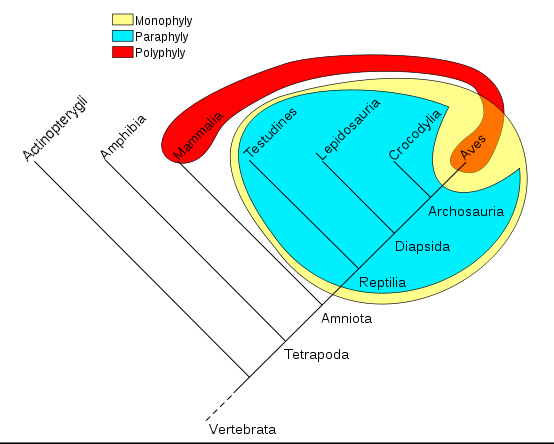 Why do nested hierarchies work in biology? The groups that form after a branching event are called ‘clades’ and the members of the group can correctly be referred to by the name of any of the clades that they are part of. This is known as monophyly (which means one leaf). Polyphyletic and paraphyletic groups are not particularly scientifically informative, since they include or exclude members of clades with no evolutionary justification. This means that scientists prefer to base names for groups on clear monophyletic clades. That’s a scientific argument for considering apes to be monkeys. Aha! I must make it clear that I have been using the term monkey as a direct match for the term Simiiformes (which includes the Old and New World monkeys, the lesser apes and the great apes) in the discussion above, but is that valid? Obviously I argue that it is, since I’ve been using it – the question should be why wouldn’t it be valid? The only logically robust answer (that I can think of) is that it wouldn’t be valid if people don’t commonly use the two terms to refer to the same things. So do people use the term monkey to refer to the apes? The simple fact is that this whole discussion has been raised because Graham Smith published an article in which he refer to apes as monkeys, which demonstrates that monkey is indeed used as a generic term to refer to apes. Another example is Terry Pratchett’s Discworld, where the Librarian (who happens to be an Orang-utan) dislikes being referred to as a monkey, which happens regularly – it may be fiction, but it seems reasonable to suggest that it reflects the use of terminology of real people. In addition, I would suggest that it’s helpful for common terms for biological groups to directly reflect the scientific terminology as much as possible, since this improves the ability of scientists to communicate with a non-specialist audience. So even if monkey didn’t mean the same as Simiiformes (which it seems to) it probably should. Otherwise monkey has no scientifically meaningful analogue, since it would refer to a paraphyletic (and therefore arbitrary) grouping. I think that my argument is pretty robust and I’ll stand by it until I hear something convincing enough to change my mind. 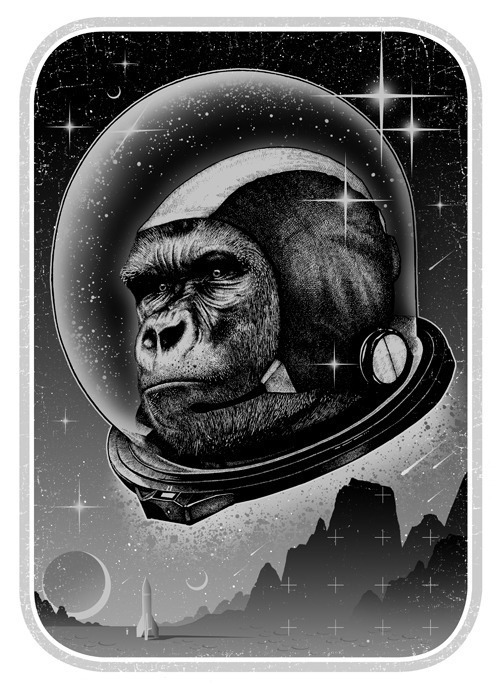 That said, I will add an important caveat – monkey is a generic term and when referring to Chimpanzees, Gorillas, Gibbons, Orang-utans and Humans the more specific term of ape should be used for clarity. After all, you don’t refer to your pet cat as a pet carnivore, or a budgie as a theropod, because generic terms omit a lot of additional information. So although apes are monkeys, they are still apes – and that means something.